HIGH EFFICIENCY walnut/coffee/cashew/nut/bean roaster 2015Newly design!!! 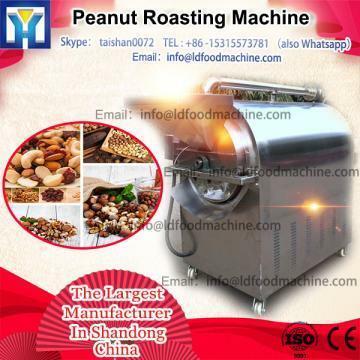 Home>Products>peanut roasting machine>HIGH EFFICIENCY walnut/coffee/cashew/nut/bean roaster 2015Newly design!!! Min.Order Quantity: One set HIGH EFFICIENCY walnut/coffee/cashew/nut/bean roaster 2015Newly design!!! 1.Uses: KLQ coffee bean roaster is mainly used in roasting peanut kernel,peanut with red coat, peanut with shell, walnut, chestnut, broad bean, soybean, etc. 2.Principles: coffee bean roaster After the food materials enter the turning cage of roaster, infrared radiation and thermal conduction of turning cage will act on the materials together, and then the temperature will raise rapidly, and the movement of water molecules in the material will increase, and the water will evaporate continuously to achieve the aim of drying. In the roasting process, the continuous movement of turning cage drives the incessant rolling of food materials. So the peanut can be heated evenly to ensure the quality of roasted peanuts.